Is AmeriCorps a lifeline for debt-burdened young Americans—or one more example of relentless government cost-cutting? Nearly one year ago, Superstorm Sandy hit the Northeast. Within days, utility workers, police officers and volunteers swarmed the flooded and sand-strewn streets of the Rockaway Peninsula in southeastern Queens. At the base of one of the two clogged bridges leading to the Rockaways, a group of young people in bright-blue jackets emblazoned FEMA Corps unloaded a truck full of supplies, gave directions to victims looking for shelter and provided logistical support to the fledgling efforts of the federal relief apparatus. Those in FEMA Corps were among the first “boots on the ground” in what has been a $60 billion federal investment in Sandy recovery. Part of the National Civilian Community Corps (NCCC), which in turn is part of AmeriCorps, the FEMA Corps members were representatives of a quiet move by the government to put young, quickly trained volunteers at the forefront of disaster relief. Slater’s team settled in at a Red Cross center in Franklin Township, New Jersey, where they managed the massive warehouse—filled with cleaning supplies, food and clothing purchased by the Red Cross and the federal government—and coordinated the delivery of goods to affected areas. 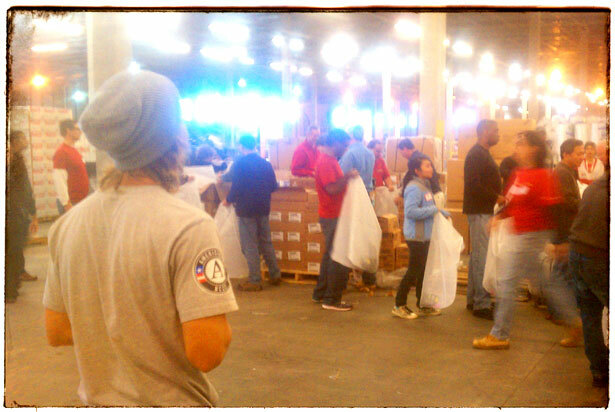 The center was filled with volunteers, with just a few Red Cross staffers and AmeriCorps members to run the site. NCCC member Kimmy Mauldin, 24, scribbled a note and tacked it to a board that tracked outgoing deliveries to the New Jersey coast. “Post-it Notes helped save the Northeast,” she joked, rushing back to the computer console where she monitored the needs of other AmeriCorps-run relief centers. AmeriCorps was founded twenty years ago, in 1993, after Congress passed the Bill Clinton–backed National and Community Service Trust Act, which established the Corporation for National and Community Service, a government organization that administers three AmeriCorps programs. Every year, AmeriCorps NCCC places 1,000 young Americans between the ages of 18 and 24 in groups that travel the country providing service and disaster relief. AmeriCorps State and National allocates grants to states to fund nonprofits and government organizations that hire their own AmeriCorps members—70,000 in total—to do everything from tutoring to social work. VISTA (Volunteers in Service to America), an AmeriCorps program with roots in the Kennedy administration, trains its 8,000 members to focus on capacity-building. A direct descendant of the New Deal, AmeriCorps has flourished despite ceaseless conservative attacks on the program and its funding. Kimmy Mauldin, who graduated from college with a degree in religion, had trouble finding a job in her hometown of Dallas. A friend encouraged her to move to Washington State, where she joined VISTA, before going on to work for NCCC. Mauldin was drawn to AmeriCorps for the same reasons I was (I served from 2010 to 2011): a dearth of jobs for recent graduates and a commitment to service that was instilled through high school service requirements. Anxiety about student debt was another motivation. AmeriCorps members receive an education award at the end of their service that can be used to pay off existing student loans or to fund more education; in 2012, the award was $5,550. Through AmeriCorps, the government is not encouraging private sector growth or subsidizing loans, but rather directly funding jobs—albeit temporary ones—putting young Americans to work on badly depleted infrastructure and desperately needed public services. For decades, conservative ideologues have rejected the idea of the government as a viable employer, ignoring the success of programs like the Works Progress Administration and the Tennessee Valley Authority in moving millions of Americans out of abject poverty in the 1930s. Putting 3.3 million Americans to work during the worst of the Great Depression, the WPA focused on employing young people and minorities, both of whom had been especially hard-hit. The WPA itself employed no more than 30 percent of the nation’s jobless, but GDP rose during eight of its nine years of existence. AmeriCorps, like the WPA, offers young Americans an opportunity to begin paying off student debt while navigating a grim job market. It also gives them the chance to develop skills in areas like teaching, emergency management and wildlife conservation. Jesse Montgomery, 26, was an AmeriCorps member in 2011, working as a writing tutor in a high school in northeast Philadelphia. “I was a recent college graduate working in a bike shop for $8 an hour and bracing myself for the moment my student loans would kick in when I got an interview for AmeriCorps,” he says. “I’d spent weeks sending out applications to all sorts of jobs—jobs I wasn’t even interested in—with little response.” His placement was challenging—the school where he tutored was overcrowded and underfunded—but he learned how to work with young people who had grown up in underserved communities. That led him to the two jobs he has held since AmeriCorps: first, as a teaching assistant at a camp for gifted youth, and second, as an after-school leader at a Philadelphia neighborhood library. The reliance of AmeriCorps members on the government for employment as well as supplemental assistance has aroused the ire of conservatives—Michelle Malkin has labeled it “FoodStampCorps,” and a 2010 Washington Times editorial bore the headline Rotten to the AmeriCorps. Cutting AmeriCorps’s funding has been a persistent rallying cry among deficit hawks; in his 2013 budget, Paul Ryan called for the elimination of the entire Corporation for National and Community Service. The federal budget sequester cut 4,200 AmeriCorps positions at a time when the program was supposed to be growing: in 2009, President Obama signed the Edward M. Kennedy Serve America Act, which would not only increase the amount of the education award but also expand AmeriCorps to more than 250,000 members by 2017. Supporters of the bill envisioned it as the greatest expansion of national service since the Great Depression. But the bill has failed to reach its goals—by a considerable degree. “The Kennedy Serve America Act has not even started down the road that it wanted to when it was signed,” says Shirley Sagawa, a fellow at the Center for American Progress who studies national service. “We’re pretty much at—or even below—where we were in terms of numbers when the Obama administration began. It is a huge disappointment, especially because AmeriCorps [pays] a double bottom-line dividend, by helping people who want to serve as well as helping communities.” But with Congress holding the purse strings tight, AmeriCorps has grown by only 8,000 positions, and further expansion is hard to imagine. AmeriCorps’s emerging role in federal disaster response makes the situation even more difficult. Spurred by the acute need for disaster relief, FEMA Corps was founded last year by FEMA and the Corporation for National and Community Service. It pays young people to travel the country responding to disaster after disaster. “In the summer of 2011, there was pretty much a disaster a week”—the tornadoes that struck Joplin, Missouri; Hurricane Irene; historic wildfires in the Southwest—“and FEMA kept using our teams,” says Kate Raftery, the national director of the NCCC. “Immediately after Sandy, AmeriCorps members were helping and registering survivors weeks before FEMA had their field office up and running. We’re building a next generation of workforce for FEMA.” The approval for FEMA Corps came directly from President Obama, who, sitting in on a meeting of disaster relief specialists at the White House, seized on FEMA deputy administrator Richard Serino’s idea for FEMA’s own NCCC division. “Corps members, quite often, are one of the first people a disaster survivor will see from the federal government,” Serino says. But with the gutting of FEMA under the Bush administration, FEMA officials argue, the agency needs to scale up as quickly as possible. “For many years, emergency management was looked at as a second career,” says Serino, “and one thing we have to do is make it into a career. FEMA Corps is a way people can get involved, get hands-on experience and then have an opportunity to work for FEMA.” Rubin counters that the pipeline to a career in disaster management is broken. “Reservists who traditionally do the work are lucky if they make $30 an hour,” she says. AmeriCorps members typically make around $6 an hour. “If your goal is to throw warm bodies out there, you’re going to throw cheap bodies. I’m deeply troubled by this, having devoted a large part of my career to having people adequately trained. Why are people getting doctoral and master’s degrees when apparently, according to FEMA, they can just learn this on the job?” On message boards, FEMA reservists, many of whom have years of experience, have expressed dissatisfaction that some of their duties are now being done by FEMA Corps members. FEMA Corps’s first disaster season was marked by miscommunication with other disaster relief groups, as well as misunderstanding between groups over what they should be doing and how they could help. More than 3,600 AmeriCorps members were part of the Sandy relief efforts, and many of them stayed on at assignments well into 2013. Responding to critiques made by disaster relief experts, an AmeriCorps spokesperson wrote that “FEMA Corps members receive extensive training, from both FEMA and NCCC, to prepare them for their assignments,” including an “intensive FEMA training” focused on skills for disaster response. Young Americans getting paid very little to perform essential work for the government: AmeriCorps is at once a real opportunity and a symptom of austerity. Its members are either being offered a pathway to a career—or they’re being used to lower the cost of social services for a government devoted to budget-cutting. Or, more likely, both.